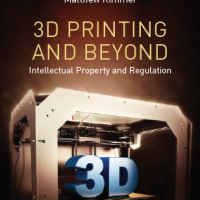 A new book titled ‘3D Printing and Beyond: Intellectual Property and Regulation’ published by Edward Elgar Publishers in February 2019 and edited by Professors Dinusha Mendis (Department of Law, CIPPM, Bournemouth University, UK) Mark Lemley (Stanford Law School, Stanford University, California USA) and Matthew Rimmer (Faculty of Law, Law School, Queensland University of Technology, Australia) explores the implications of 3D Printing and Additive Manufacturing in three core jurisdictions: the UK, USA and Australia. Providing in-depth analysis of the current state of affairs, as well as outlining future issues and developments, 3D Printing and Beyond addresses both the challenges and opportunities created by 3D Printing. Bringing together both academic and practical experts, the original contributions to this book consider the regulation of new, emerging and future technologies and their implications for the legal landscape. The book goes beyond 3D printing and its relationship with intellectual property to the realms of ethics, contracts, socio-legal aspects and economics. Dr. Marc Mimler, Senior Lecturer in Law and member of CIPPM and Mr. Dukki Hong, PhD Candidate at CIPPM are amongst the contributors. 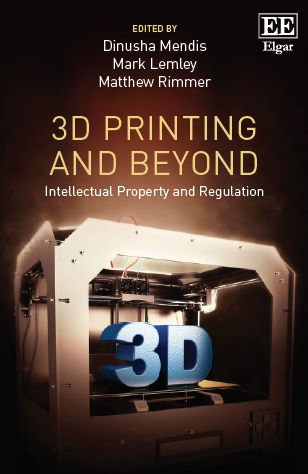 Intellectual property academics will greatly benefit from reading this book, as it not only explores the myriad ways in which 3D printing has altered the horizon of IP law, but also offers ideas for areas of future research. Practitioners and policy makers will also benefit from the useful examples and cases used in this book. The book is endorsed by leading experts in the field of 3D printing and IP law, drawn from academia, practice and industry. “3D Printing and Beyond is a thoroughly considered and impressive exposition of US, UK, and Australian IP law in the context of 3D printing. The distinguished group of authors, all of whom are thought leaders on the issues of 3D printing and IP, explore the law as it exists and perceived gaps, potential market responses to 3D printing-driven democratization of manufacturing, whether new laws are needed and what they would look like, and the applicability and enforceability of current and future IP laws in a 3D printed world. Interspersed with detailed analyses of the potential impact of 3D printing on patent, copyright, trade secret, trademark and trade dress, and design laws, and the effect of such laws on 3D printing, are intellectually stimulating essays on the potential economic and societal effects of 3D printing. The book wraps up with a fascinating discussion of the emerging issue of 3D printcrime. This book is a must-read for anyone interested in the intersection of IP law and 3D printing, and beyond”. “3D Printing and Beyond serves as a helpful guide for thinking about patents, design protection, trademark, and copyright in relation to 3D printing in three important jurisdictions. It is a useful resource for anyone trying to begin to understand the challenges that emerge as this technology matures and reaches deeper into our everyday lives”. “As a pioneer in the 3D printing industry for the past 30 years, Materialise has head started some of the most innovative projects. As such, we understand the technology and the challenges of creating digital supply chains very well. Now that the technology is becoming more broadly adopted and many companies see the great potential of 3D printing to produce mass customized products, it is very important to understand the emerging intellectual property and legal challenges. Therefore, we very much welcome this book’s effort to go beyond the hype and raise some important questions surrounding intellectual property and regulation concerning the challenges and opportunities of 3D printing as an enabler of digital supply chains. Now, more than ever, it is time to raise such questions on how we are going to collaborate in the future between the private and public sectors in order to make sure that we do not inhibit innovation while creating something that is good and safe for our society”. Further information about the book, including a list of contributors and contents can be accessed here.